Here's my latest project. I had some leftover yarn from my super great PRGE pal--- she sent me a lot for another project. 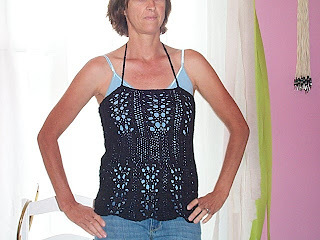 Soooo, I knit up this cute halter top that was from the Spring Issue of Interweave Knits. I was looking to see if you were an Aussie for Bingo and I had to comment on your tank, I love that! It is very pretty! I love open work things, I can't wear them, but I love making them and looking at them! That is sweet! That is terrific!! So glad the hemp went to good use....it looks wonderful!! !